Would you like to open your house? 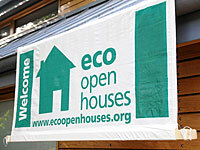 Eco Open Householders all have positive things to say about being in the event. The approach and the commitment that they have made to retrofitting their home or building their new home is recognised and appreciated warmly by the visitors. The testament to their positive experience is that all the householders involved have wanted to be in the event again! If you might be interested in being involved in our event in 2014 or any time in the future please contact us and we be in touch to discuss your involvement.